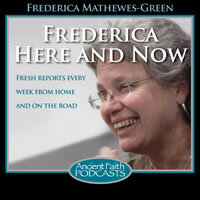 Today we present an interview Frederica conducted with Fr. Stephen Wojcichowsky, director of the Metropolitan Andrey Sheptytsky Institute in Ottawa. They recently held a conference that they called "The Sheptytsky Institute Study Days," and Fr. Tom Hopko and Frederica were among the speakers. Recycled molecules and atoms from the foundation of the world present a wonderful perspective on the shed blood of Christ. On this, the greatest of all Feast Days, Fr. Thomas explains what we, as Orthodox Christians, know for certain about Jesus Christ. This time, Fr. Thomas speaks of the Activities and Actions of God. FMG: Today I am at the Sheptytsky Institute Study Days at St. Paul University in Ottawa, Ontario, Canada. This is the Metropolitan Andrei Sheptytsky Institute for Eastern Christian Studies, and I’m talking to the director of the Institute here, Fr. Stephen—can you pronounce your last name, please? Fr. Stephen Wojcichowsky: It’s Wah-juh-kow-skee. FMG: Tell me a little bit about the Institute and about the Study Days. What are we doing here? Fr. SW: This is our first ever attempt at pulling together people from both academic and non-academic backgrounds so we can have what we call an Eastern Christian feast for the heart and mind. And we have with us very special guests, in the persons of Fr. Thomas Hopko, Khouria Frederica Mathewes-Green, and our own Fathers Peter Galadza and Andrei Chirovsky, along with quite a number of Eastern Catholic and Eastern Orthodox workshop leaders as well. And our hope is, first of all, to bring the two communities together so that we can study and pray together. We have matins, liturgy and vespers where we do pray together, and to be able to look at our faith from a perspective of living in this world, embracing the need to engage with the world, and to be able to be witnesses of Christ’s light to the world. FMG: It’s a very wonderful vision, and of course, one that Orthodox Christians very much share. I was surprised to learn yesterday that this is the only eastern Catholic institution in North America, is that right? I mean, learning institution. Fr. SW: It would be correct to say that its Eastern Catholic roots have gone into the organization of it. We are part of a very interesting university structure, in that Roman Catholic, Anglican, Eastern Catholic and Eastern Orthodox, those four groups, figure very strongly in the makeup of our faculty of theology. And I would think that that’s a very unique setup in North America. Our own institute has roots in the Ukrainian Catholic Church, and so we do put a particular emphasis on the Kievan Tradition, but at the same time, because we do call ourselves an institute of Eastern Christian studies, we are open to all Eastern Christians, and those who would like to learn about Eastern Christianity and have it inform their faith as well. FMG: And I think there is not an Eastern Catholic seminary, is there? This would be the closest place a person could come to be formed in the Eastern, rather than Latin, tradition. Fr. SW: Well, we do have a seminary, but that seminary doesn’t teach courses. It is here in Ottawa, and that seminary is for all of Canada. And the seminarians come to our institute to get their academic training. And when I say academic training, you’re of course looking at it from an Eastern Christian perspective, that means with pastoral and spiritual sensitivity. FMG: As far as I’ve been able to see, the Orthodox and Eastern Catholics who are here at the conference these last few days- they’re so much alike. It seems to be the same spirituality. It looks as if Eastern Catholic and Eastern Orthodox clergy in Ottawa are very friendly and very supportive of each other. Do you find that to be the case? Fr. SW: Absolutely. In fact, I don’t know if I can say this right here… If it weren’t for our connection with the Antiochian Orthodox parish here in town, you, Khouria Frederica, would not be with us today. FMG: They’re very generous, Fr. Gattas paid my way here. Fr. SW: So, we work together. We educate Orthodox students, as well. In fact, the very first person to have gained a doctorate here is now a priest in the Orthodox Church serving in the province of Saskatchewan. FMG: Do you find there are things that your Orthodox brothers understand that maybe your Latin or Roman Catholic brothers do not? FMG: That’s very beautiful and very important. I guess that one of the differences that I as an Orthodox person sees between Eastern and Western views, has to do with the idea of salvation as having to do with Christ’s merit, paying the atonement price to God. And I think that- this may be ignorant but it’s just something that occurs to me- it seems like in our Eastern Tradition there really isn’t an idea that God the Father has to be paid at all. It seems to me a very profound difference between Eastern and Western Christianity. As we see it, our Father just forgives us, as in the story of the Prodigal Son. Do you think I’m accurate? You’re the theologian, and I’m not, so tell me what you think. FMG: Because there’s been a real recovery—back to the fount, to the springs, to rediscover what the early church believed. And that’s very encouraging and very beautiful. Fr. SW: In fact, many of the authors that both Eastern Catholics and Eastern Orthodox and Roman Catholics study are Roman Catholic patristics scholars. Both just prior to the second Vatican Council, and after the second Vatican Council. People like Danielou and von Baltasar have brought the Fathers to life for everyone in the Church. FMG: That’s wonderful. This morning I came to the liturgy, and I realized once I got there, as I’d prepared and I’d fasted, and I’d said the prayers, that I wasn’t sure if this was a Catholic or an Orthodox liturgy. And I kept watching and it was hard to tell. It was wonderful to see how very much it is like ours, the hymns, the devotion, just the beautiful feeling in the room, it was indistinguishable from an Orthodox service. So I thought, maybe they’ll cross themselves backwards. But no, that was the same. So I just kept listening and looking for hints, but finally I had to ask somebody. So, it felt to me like the same faith and that’s a wonderful thing, to feel that fellowship. Fr. SW: First of all, thank you for saying that. One of our goals is to be able to recover the spirit of Eastern Christian worship as it developed throughout the centuries in the Eastern Christian world. There’s no question that many of us, myself included, had many Latin influences, growing up, in terms of our liturgical life. FMG: You grew up Ukrainian Catholic? Fr. SW: I did. I grew up Ukrainian Catholic and it’s a matter of fact that much of our worship had been laden with Latin elements. But over the course of time, and thanks to our great leadership in our church, we have learned where we have come from. I like the way one of our patriarchs put it, he said “We are Orthodox in Faith and Catholic in love.” In the sense that we are in full communion with the Church in Rome, but at the same time, our faith, our liturgy, the whole ethos of our church is Orthodox. And one priest in Ukraine I asked, “What do you call our church over here?” I was thinking of something else, but he came back and said, “Oh, that’s a very straightforward thing. We’re the Catholic Orthodox. They’re the Orthodox, and we’re the Catholic Orthodox.” And I thought, that really does explain who we are. FMG: So you really stand facing both directions. You have a witness to the Orthodox and a witness to the Latin Catholics. Fr. SW: That’s a very good way of putting it. Thank you. FMG: Thank you, thanks for making we welcome here. It’s really been a delightful conference. Hope we get to do it again sometime. Fr. SW: So do I. Thank you.